BRECOflex CO., L.L.C. manufacturers high precision pulleys that perfectly match our belts. Our stock aluminum pulleys can be shipped the same day as ordered. In addition, we have the engineering and technical capabilities to machine custom product to practically any specification. They are available in aluminum, steel, stainless steel, or delrin. There are advantages to purchasing BRECOflex timing belts and pulleys together. As a single source provider you have the convenience of having customer service and technical support in one place. For new customers, our engineers will be able to confirm that your tooth number, pitch and width are optimal for our application. Furthermore, BRECOflex guarantees perfect meshing when our timing belts and drive components are used together. No other manufacturer and provide the same level of accuracy and outstanding service. To learn more about custom and stock product, you can select an option below to view stock product numbers, design a custom pulley and receive a free quote. If you have already obtained a quote and would like to place an order, you can do so here. 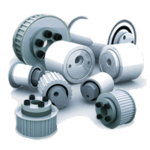 Create BRECOflex custom pulley part numbers for quoting and ordering.